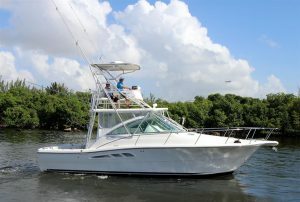 Check out this 33' Rampage boat for sale in Florida! : Atlantic Yacht & Ship, Inc. Check out this 33′ Rampage boat for sale in Florida! Word just came in from Gregg Silver that he has listed a great deal on an used 33′ Rampage boat for sale in Fort Lauderdale, Florida! Launched in 2006, you must come see this lightly-used 33′ Rampage for sale. In the first place, this boat has all the options you want along with the quality of Rampage boats. In face, this boat is located nearby the Fort Lauderdale airport so no problem for day visitors. It is worth a trip to see this fishing machine! The well designed cockpit boasts nonskid sole, Pompanette fish chair, transom well, a bait tackle center, and a huge built in fish box, and more! Overall, when you first approach this 33′ Rampage dockside you will notice her serious marlin tower. You will immediately want to jump on board with tackle and cold drinks to find a good weed line! Also, this vessel can be easily boarded from the wide cockpit gunwales. In fact, Rampage is known for rugged, no-nonsense fishing boats built for blue water. For more information on this beautiful used 33′ Rampage boat for sale be sure to contact Gregg Silver today! For over 56 years Atlantic Yacht & Ship has been serving the yachting community. Our headquarter sales office is dockside at Harbour Towne Marina in the heart of the yachting capital of the world, Fort Lauderdale, FL. Our in-house waterside service department provides general yacht services. These range from new teak, to engine rebuilds, captain services, and everything in between. Whether purchasing or marketing a quality vessel, Atlantic Yacht and Ship, Inc. is your one stop resource. We provide the highest quality service and sales in the yachting industry today. If you are looking at yachts for sale, or thinking about selling your yacht, it is always wise to have an experienced broker representing your interests throughout the deal. Contact Atlantic Yacht & Ship at 954.921.1500 or click here.